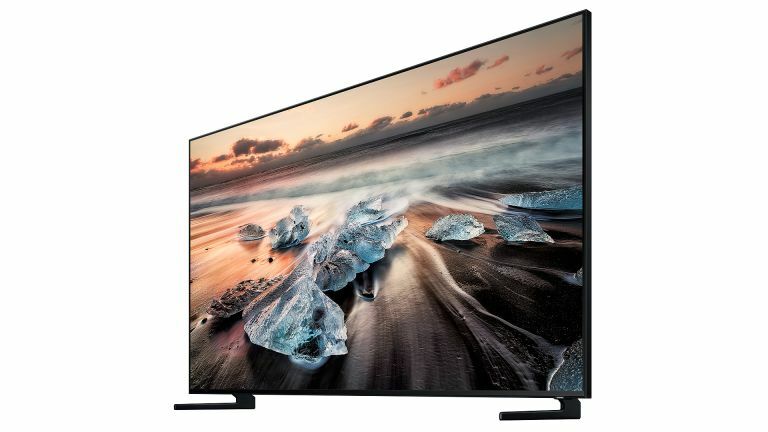 What’s the point of an 8K TV? With this 75-inch Q900R, Samsung is hoping to give you a compelling answer, but it's not easy. After all, 4K screens have only just elbowed regular HD out of the picture. Do we really need another resolution revolution? The answer, of course, is no. But that’s not going to dissuade the TV industry from embracing the next big thing – and Samsung is the first big brand to break cover with a screen that goes where no telly has gone before. Needless to say, the prospect of 8K for the home has had us salivating. Just as 4K UHD offered a four-fold jump in resolution over 1080p HD, 8K introduces a screen resolution that’s four times as dense again. The catch, of course, is that there is no 8K content to be had. Not even a sniff. Which means the real appeal of this pricey pixel pusher hangs on its ability to upscale 4K UHD, regular Blu-ray and that pile of dusty DVDs you have in the spare room. There's zero chance of a price cut on this but we're just going to point you towards our best Black Friday deals for the sheer hell of it. Also available: Samsung QE65Q900R. This is much more 'affordable' at around £4,999. The 75-incher is not only very pricey indeed, it's also largely impossible to find in the UK at present. A cursory glance would suggest there’s nothing out of the ordinary about the Q900R. Just like its 4K-only stablemate, the Q9FN, it’s a slightly chunky flatscreen, given girth by a FALD (Full Array Local Dimming) backlight. As you might expect, the screen tethers to Samsung’s latest (large) One Connect box. This features four HDMI inputs, optical digital audio output, Ethernet, Freeview HD and satellite tuners, plus a trio of USBs. The pair are linked by a single Near Invisible cable, which carries both power and AV. Note that the HDMI ports on this box are not the latest HDMI v2.1 specification, because they are not yet available to TV manufacturers. This means the One Connect Box can’t accept native 8K at 60fps from an external source (if there was one). They do have some aspects of the HDMI 2.1 specification though, and apparently one HDMI input will accept 8K at 30fps, but this couldn’t be tested for obvious reasons. Samsung is now saying that Q900R buyers will be able to replace their One Connect boxes with the new HDMI 2.1 versions in the new year upon request, and I recommend you take them up on that generous offer. The set comes with the usual Samsung remote control twinset, one a standard IR clicker and the other a Bluetooth designer pointer. Ultimately, the appeal of this TV hangs on its video performance. There’s a hefty price premium attached to the newly baked panel and associated image processing technologies. The good news is that with native 8K footage it looks absolutely amazing. The detail and clarity it presents is second to none. Our 8K viewing selection, provided by Samsung on a USB, comprised fancy footage of city spaces, pets and people, and all looked so real we felt we could reach out and touch them. But for the foreseeable, owners will be watching 4K, HD or Talking Pictures. This is where the set’s AI-based upscaling comes in. Certainly UHD Blu-rays look extremely good. Guardians of the Galaxy Volume 2 is vibrant, detailed and a joy to watch. But was Samsung’s much hyped Machine Learning Super Resolution (MLSR) technology adding much above a comparable high-end 4K set? Not really, at least nothing appreciable at this screen size. At trade shows, Samsung has shown upscaling technology able to do remarkable things with SD content, at least making it approach HD clarity. But for all its strenuous efforts, the Quantum 8K processor at work here wasn’t making much of a dent on regular DVD. A Superbit (hands up if you remember them?) DVD pressing of Shakespeare In Love, which opens with a descent into the Globe theatre, looked just as ropey here as it does on any other modern large screen. Clearly, the potential is there when it comes to harnessing machine learning to improve picture clarity, but at this early stage there’s still homework to be done. Black level performance is solid, particularly in rooms with some ambient light. Letterbox bars look suitably cinematic. Perhaps the Q900R doesn’t look quite as inky as the 4K Q9FN though. HDR support covers HDR10, HDR10+ and HLG, while Dolby Vision is technology non grata. We measured HDR peak brightness just under 1200 cd/m2 (aka nits). This is plenty bright for effective HDR, but it’s not quite the sunlight cannon some may have been expecting. One trait that did become slightly irksome was a lag shifting to and from normal luminosity to a bright highlight. Often quite pronounced, it looked as if the backlit algorithm was having a problem keeping up with fast moving dynamics. In general use, the set offers the same image preset selection, regardless of whether it’s delivering SDR HD or HDR 4K. There’s a choice of Dynamic, Standard, Natural and Movie, plus some calibration modes. Most users will gravitate to either the Standard or Natural modes. There’s actually quite a difference between them. The opening sequence of Thor Ragnarok, in which the Thunder God does battle with Surtur, sets the apl (average picture level) far too bright in Standard mode. Sure, the fire demon looks suitably fiery, but the background cave detail looks over-exposed, shadows become floodlit. Natural offers a more convincing balance. Motion handling is good. With Auto Motion Plus left in Auto, there are motion artefacts (although we’ve seen worse, to be honest), while horizontal pans are smooth and sharply detailed. In the Custom mode, with blur reduction on 10 and Judder on 3, motion artefacts are all but eliminated, although pans suffer mild judder and lose detail. This is the better movie option, if you don’t want to to turn off image interpolation entirely. A screen of this calibre should be used with a separate sound solution, but the on-board audio system is perfectly fine. The Q900R doesn't suffer from thinscreen syndrome. You could probably get away without a soundbar. Smart connectivity is no different from other high-end Samsung screens. The Q900R employs the familiar Tizen Smart OS, accessed via horizontal bars. One of these has curated content, the other a list of apps and services. It’s a solid smart platform with much to like. It also boasts Ambient Mode, which allows the set to serve a purpose even when no one is watching. It can blend chameleon-like with wall-coverings, function as a picture gallery, or display a news ticker. Available apps include Netflix, Amazon Prime Video and YouTube. The set doesn’t support Freeview Play, however there is a full complement of catch-up TV available (BBC iPlayer, My5, Demand 4, ITV Hub). As the first of a new breed, it’s easy to be awed by the Q900R. Samsung has given its QLED fleet an impressive flagship, and with native 8K it looks like no other panel you’ve seen before. Image quality is staggeringly good. It’s like reality. Only better. But with no 8K content on the horizon, a premature One Connect Box, and upscaling technology that doesn’t yet deliver the goods, this innovative set is really only going to appeal to die-hard early adopters.